New Delhi [India], May 7 (ANI): When it comes to sharing her birthday excitement, Adele has a unique way. The songstress, who turned 29 yesterday took to her Twitter page and shared a series of photos of her makeover that made her completely look like an old lady. She captioned the snap as, "Nearly 30! Thanks for the well wishes. See you soon x." In the photos, the ' Hello' hit-maker can be seen wearing a pink sweater, wrinkled skin, gray hair and glasses. 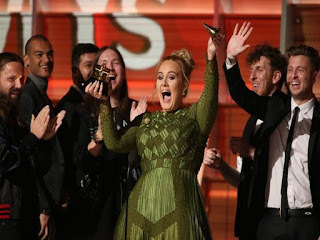 This year has been really great for her as the singer created history by becoming the only artist in Grammy history to sweep the Album, Record and Song of the Year twice. Recently, the ' Send my Love' singer increased her earnings by almost 50 per cent in the past year, rocketing her wealth to whopping 125 million GBP and became the richest musician under 30 in the British isles.